Imagine also that this tool fairly frequently explodes, emitting highly toxic chemicals, particles, and fibers unsafe to breathe into the air for miles around. Normally, that’d be a problem. But if this tool is needed for killing lots of people, we’ll work with its flaws, won’t we? Now, what if this new gadget was expected to cost at least $1,400,000,000,000 over 50 years? And what if that money had to be taken away from numerous other expenses more beneficial for the economy and the world? What if the $1.4 trillion was drained out of the economy causing a loss of jobs and a radical diminuition of resources for education, healthcare, housing, environmental protection, or humanitarian aid? Wouldn’t that be a worry in some cases, I mean in those cases where the ability to kill tons of human beings wasn’t at stake? What if this product, even when working perfectly, was a leading destroyer of the earth’s natural environment? What if this high-tech toy wasn’t even designed to do what was expected of it and wasn’t even able to do what it was designed for? The tool I’m describing is called the F-35. 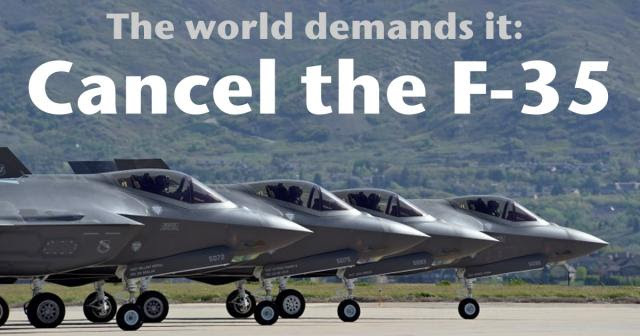 At RootsAction.org you can find a new petition launched by locally-minded people acting globally in places where the F-35 is intended to be based. Also at that link you’ll find explanations of how the tool I’ve been decribing is the F-35. Wars are endangering the United States and other participating nations rather than protecting them. Nonviolent tools of law, diplomacy, aid, crisis prevention, and verifiable nuclear disarmament should be substituted for continuing counterproductive wars. Therefore, we, the undersigned, call for the immediate cancellation of the F-35 program as a whole, and the immediate cancellation of plans to base any such dangerous and noisy jets near populated areas. We oppose replacing the F-35 with any other weapon or basing the F-35 in any other locations. We further demand redirection of the money for the F-35 back into taxpayers’ pockets, and into environmental and human needs in the U.S., other F-35 customer nations, and around the world, including to fight climate change, pay off student debt, rebuild crumbling infrastructure, and improve education, healthcare, and housing. David Swanson is an author, activist, journalist, and radio host. He is director of WorldBeyondWar.organd campaign coordinator for RootsAction.org. Swanson’s books include War Is A Lie. He blogs at DavidSwanson.org and WarIsACrime.org. He hosts Talk Nation Radio. He is a 2015 and 2016 Nobel Peace Prize Nominee.